Cardio Boxing with a circuit to improve your strength! Boxing Circuit is a car­dio box­ing based class with pads and gloves, plus a cir­cuit designed to improve your strength and fit­ness. A great mix of car­dio, core strength and resis­tance work. Lots of fun and a good stress relief. 1. You'll begin by warming up your body, introducing your muscles to the workout, and learning all the basic boxing punches that will be used throughout the class. 2. Your instructor will then guide you through the main workout which is split into two main sections. The first is a variety of cardio boxing based drills (switching pads and gloves with your partner as you move through the class). The second is a circuit that uses a variety of equipment including sandbags, powerbags, kettlebells, battleropes and more. It's a great total body workout - you will love it! 3. We finish with a stretch for your hard worked muscles! We supply cotton inners, boxing pads and boxing gloves. If you have your own boxing gear that you're comfortable using, bring it along. Apart from that bring a water bottle and towel. 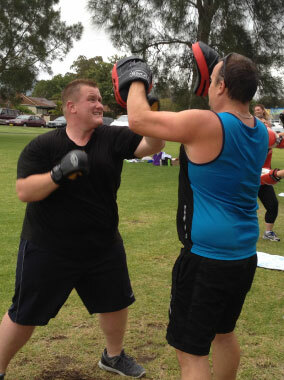 Boxing Circuit is fun for everyone! Old hands and newcomers can do the class together as everyone can work at their own level and all exercises can be scaled to suit your fitness level. 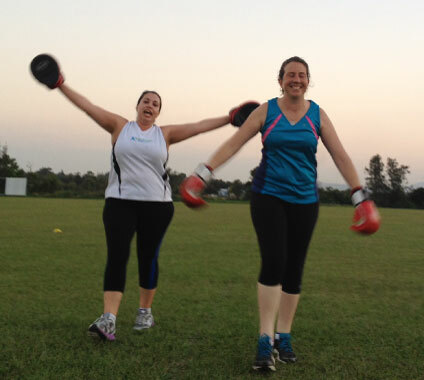 WANT TO TRY A BOXING CIRCUIT CLASS? Find the next Boxing Circuit class on the timetable!